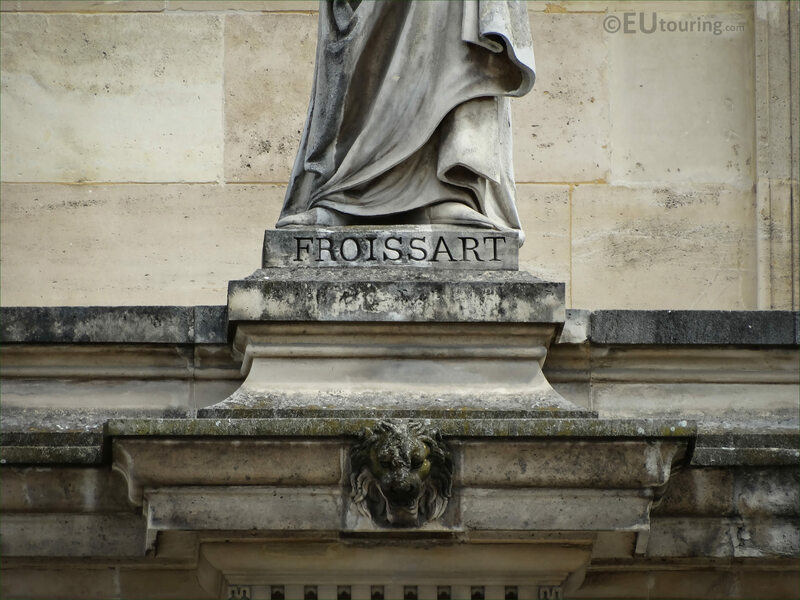 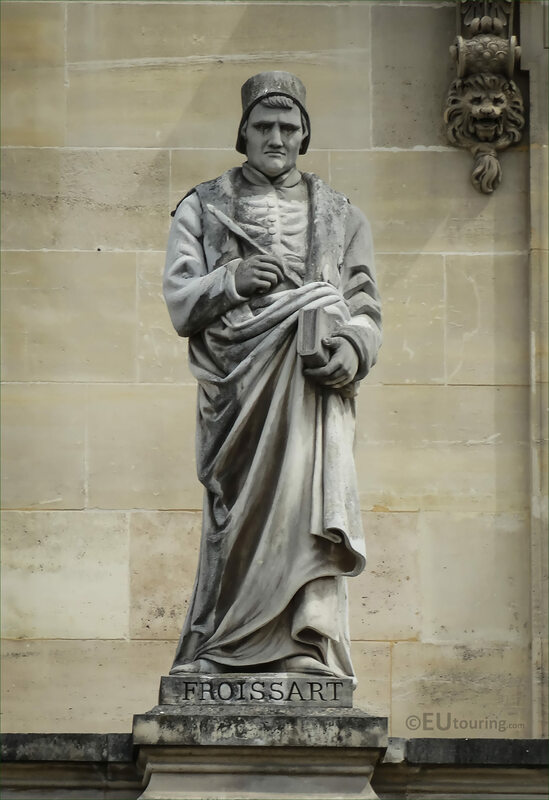 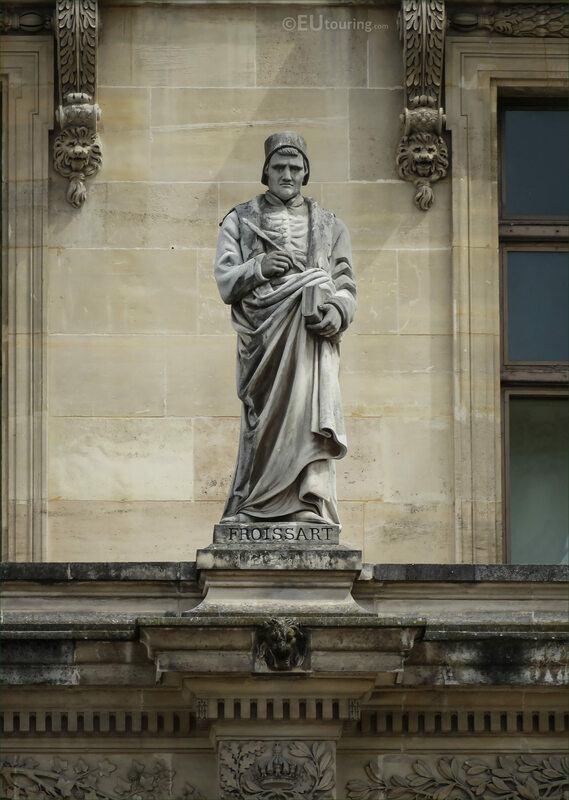 We were again within the Cour Napoleon of the Musee du Louvre in the 1st Arrondissement of Paris, when we took these high definition photos showing a statue dedicated to Jean Froissart, which is on the Aile Turgot wing and was sculpted by Philippe Lemaire. So this first HD photo showing the stone statue of Froissart is situated on the first level balustrade of the Aile Turgot wing, and can be found third from the right hand side as you are looking at the facade from the main courtyard where the entrance to the former Palais du Louvre is located. 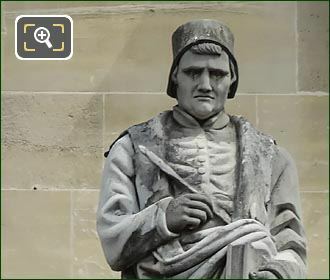 Now this was produced by Philippe Joseph Henri Lemaire who was born in 1798 and became a French sculptor, working in a neoclassical academic style, and winning the Prix de Rome in 1821 he received numerous commissions including for the Arc de Triomphe and Madeleine Church, but please do not get confused by another person with the name Philippe Lemaire who was a French actor. And in this last image you can see the base of the statue with the surname, which is dedicated to Jean Froissart who was a medieval French author and court historian and wrote several works, including the Chronicles he is most recognised for along with his history writings on the first part of the Hundred Years War, yet very little is known about his life and even his dates of birth and death are not certain but were around the 1330s to the start of the 1400s.